St. John's Lutheran Church presents “ART-A-WHIRL 2013”, works by 6 local and regional artists as well as tours of rare collection of stained glass windows. 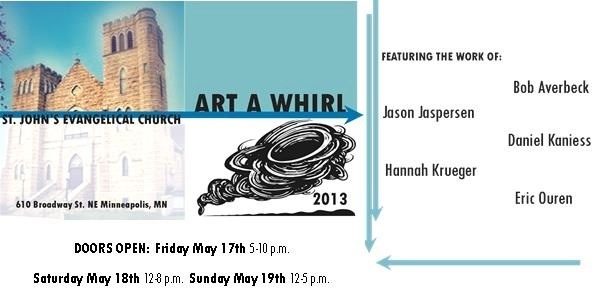 Opening Reception: Friday, May 17th 5-10 p.m.
St. John's Lutheran Church: Art-a-Whirl 2013. Sponsored by the Northeast Minneapolis Arts Association, Art-A-Whirl is the largest open studio tour in the country. It’s a great opportunity to tour private artist studios and galleries, connect with the artists, and purchase original artwork. At St. John's Lutheran Church in Minneapolis, we see it as an opportunity to connect with the community directly outside our doors and would like to invite you and your family to also be a part of this event. We welcome you to come view the artwork that will be on display by talented artists within our WELS community at St. John's as well as enjoy the rare architectural beauty on display inside the sanctuary. Sample images available in medium and high resolution. Contact Kai Grohs: killa_kailani@yahoo.com 612-270-1619.